On the crest of Santorini’s Caldera sit the Galaxy Suites, a luxurious collection of private abodes decorated in traditional Greek style with a modern twist. Attention to detail is paramount at this choice location; no expense has been spared when fitting the 10 exclusive suites and outdoor areas. 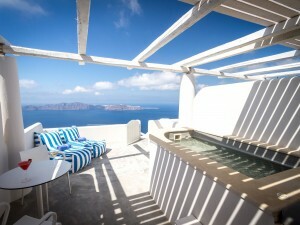 White and blue are the unifying tones of the accommodation, and with the vast blue sky above and the indigo sea sprawled out in front with a clear view of the dormant volcano-islands and sunset, it is no wonder the Island of Santorini has been acclaimed as one of the most beautiful locations in the world. Our luxurious honeymoon suites, with queen-size beds and handmade mattress are decorated in traditional Greek style with a modern twist. Size: 31 sq.m./333.68 sq. ft.
Our luxurious modern suites, features a comfortable bed with handmade mattress, beautifully decorated seating room, and a large bathroom with shower.